To cement you kit together is only half the job, maybe not even that. Painting is very important and sometimes painstaking. There is many brands to chose from and special paints for special purposes. This is by no way a complete guide to paints but hopefully useful to narrow down the choices a bit. Between all manufacturers there is two main types of paint available, enamel and acrylic. There is plenty articles on the net about which is best and the differences between the two. Basically, when I'm concerned, the most important difference is that enamel colours are more toxic than acrylic. There are a few more differences that also talks for the acrylics. They solve with water or alcohol when for enamel colours you need toxic thinners. Acrylic doesn't need stirring as much and dries faster. However there's a few draw backs with acrylic colours too. Primarily they does not adhere as well as enamel paint and makes the use of primer more important. It also usually needs more coats to get the right colour depth. Personally I've totally converted to acrylic paint because I think it's advantages over rule enamel. There is several brands to chose from and usually it's a matter of what brand your local hobby shop stock that makes the decision. 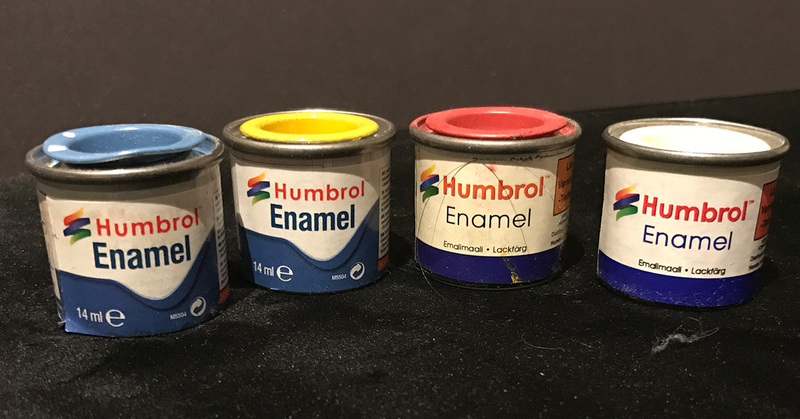 Classically Humbrol has been the dominating brand in plastic modelling. It's small cannisters with enamel paint has been here forever. Unfortunately for Humbrol the toxics legislation has forced them to change the recipes notably making it harder to mix and get a good result. And even if they started with acrylic colours their enamel paint is still dominating. 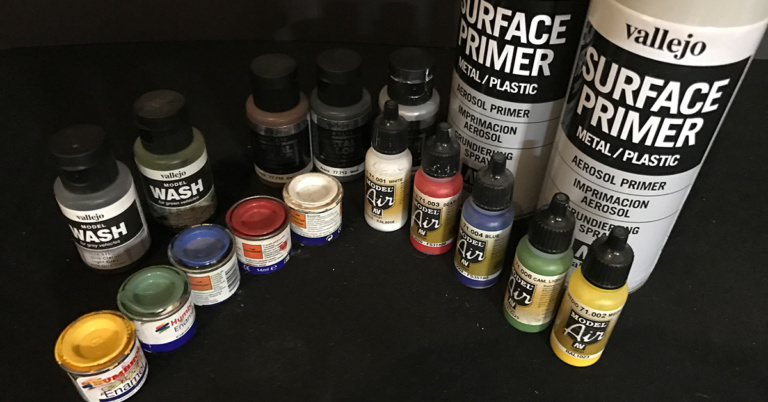 To tell the truth my experience with the paint brands as Tamiya, Gunze, Testor, Revell etc. is limited. My local dealer stocks Vallejo and predominantly their Model Air brand. 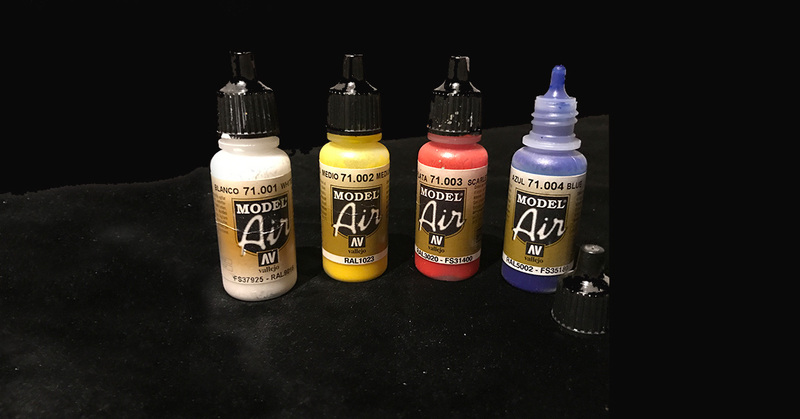 The model air is specially adapted for airbrushes which suits me fine as I mostly apply my paint that way. It's still fully possible to use it with ordinary brushes but better for smaller areas and to touch up. 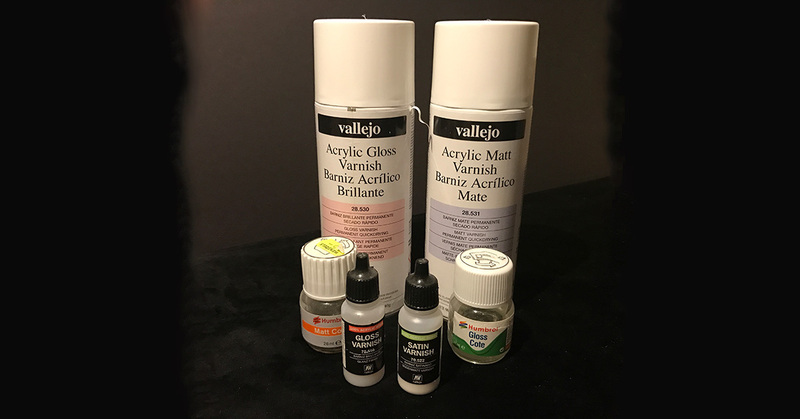 Vallejo have a Model Color brand that is better suited for using with brushes but it's very expensive to keep a reasonable range of colours of both sorts. 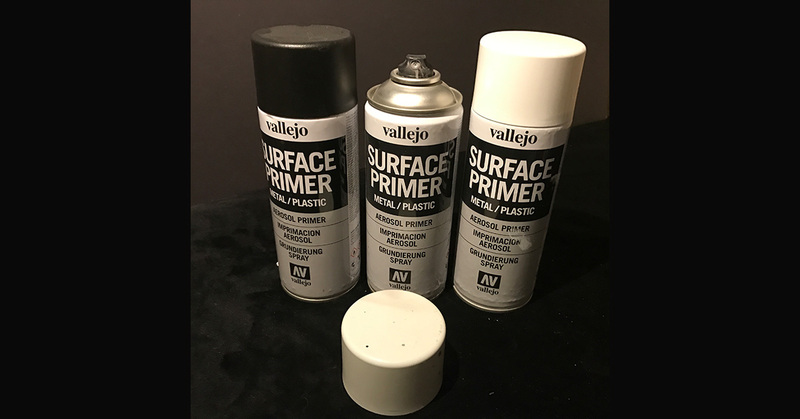 One clear advantage with Vallejo's paint is that it comes in bottles with drop caps which makes it easy to pour and minimizes spillage. All said about Vallejo also goes for the brand MIG. Primer is a coat of colour that you cover the whole kit with, usually it's light grey or white. If you're using acrylic paint it's important to prime your surfaces before painting. But it's a good idea to prime when using enamel colours too. 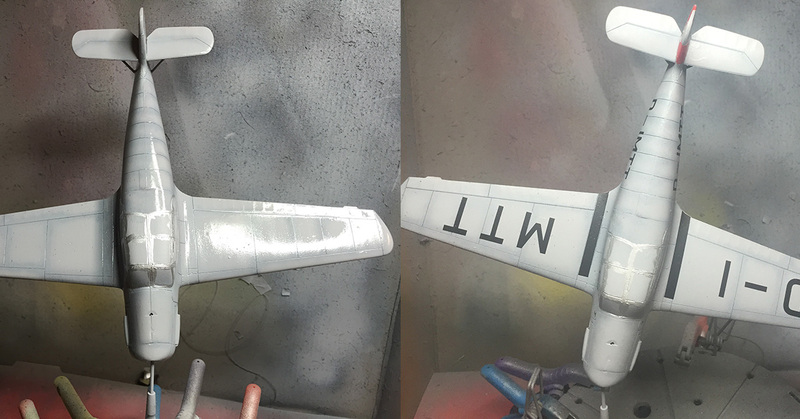 One of the advantages with the use of primer is that it makes it a lot easier to find blemishes like visible joints or glue fingerprints on the surfaces. Some times you have to repeat putting primer on, fixing the problem and then prime again. The biggest advantage is of course that paint adhere better to a primed surface but also it reduces the number of coats of paint that's needed for a good result. As the primer gives the entire model a single base colour you don't need to cover differences between for example plastic and putty. When painting metallic colours then it's better to use a gloss black primer as it gives the metal colour a better depth. I find it easier to apply the primers with spray canisters. As the primer should be covering the entire kit it's a lot less trouble than using an airbrush that needs cleaning etc. afterwards. The primary function of varnish is to protect the paint. There is basically three types of varnishes for models, gloss, satin and matte, and of course which one you need is all depending on what end result you want. For the best result you need more than one layer of varnish however. Sometimes it pays to varnish your acrylic paint before masking it off for another colour as the varnish makes it less likely to peal. When you're happy with how your painting looks you should seal the kit with a layer of gloss varnish. Why you ask, I want a matte look. Well it's all about the decals. A matte surface is matte because it has a microscopic grainy surface and this causes the decals to not thoroughly settle on the surface which often enough results in air bubbles under the decal. With an even, glossy, surface the decals settles better. See more about decals under "Signing up". When all decals is in place finish off with a layer of varnish depending of the type of end result you want, gloss, satin or matte. The last layer over the decals gives the entire model the same surface and the decals looks more like they've been painted on rather than... well decals. 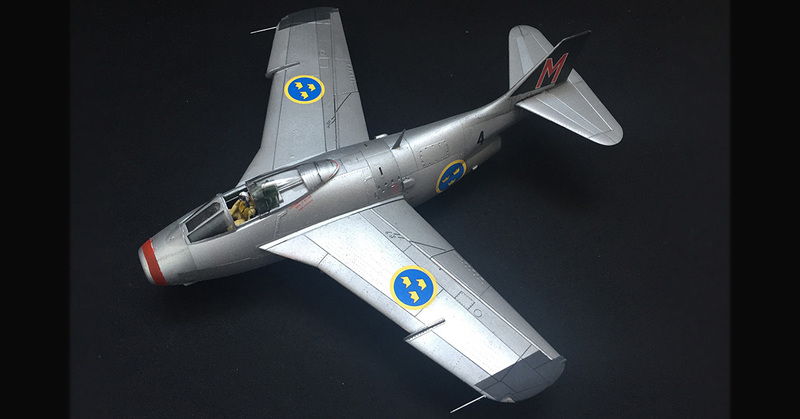 Painting a metal finish such as on an unpainted metal aircraft can, if you put some extra effort into it, get some marvellous results. First try to find some metal colours you like. 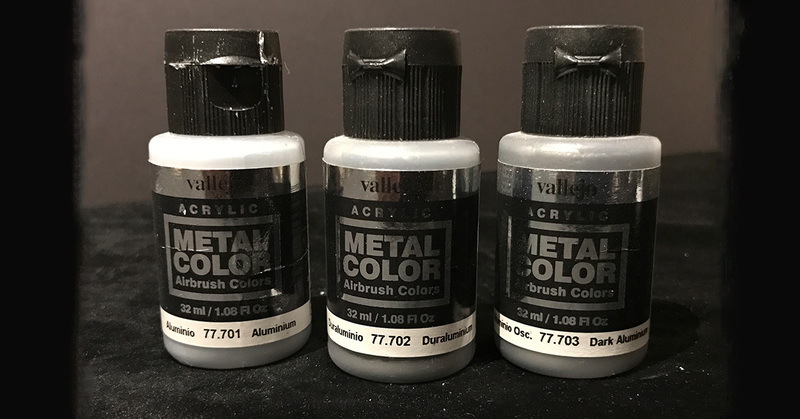 Personally I prefer Vallejo's Metal Color range. These are thinner than their Model Air equivalents and gives very good metal finishes. First make sure to start with a gloss black primer, as said before this gives a better depth to the metal colours. Then paint a base metal colour such as aluminium or whatever the instructions states. But as you can see from reference pictures the different panels usually have different shades of metal. So carefully mask off different panels and give them a coat off a different metal shades. The end result is great.